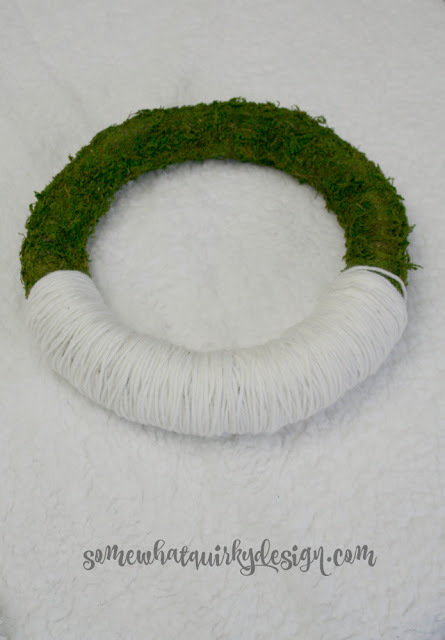 I have this wreath I wanted to show you. Actually two wreaths I wanted to show you. I mean isn't that adorable? I like it so much that I'm going to make a bigger one just like it next year. I actually made a bigger one. It doesn't fit between the door and the storm door. So I put it on the storm door. And the clear tape I hung it with broke. And the wreath fell into the snow. And the little trees went everywhere. I had to dig them out. So I put the wreath away and used the scarf and trees elsewhere. That's the life-cycle of a wreath around here. That's how old it was when it died. 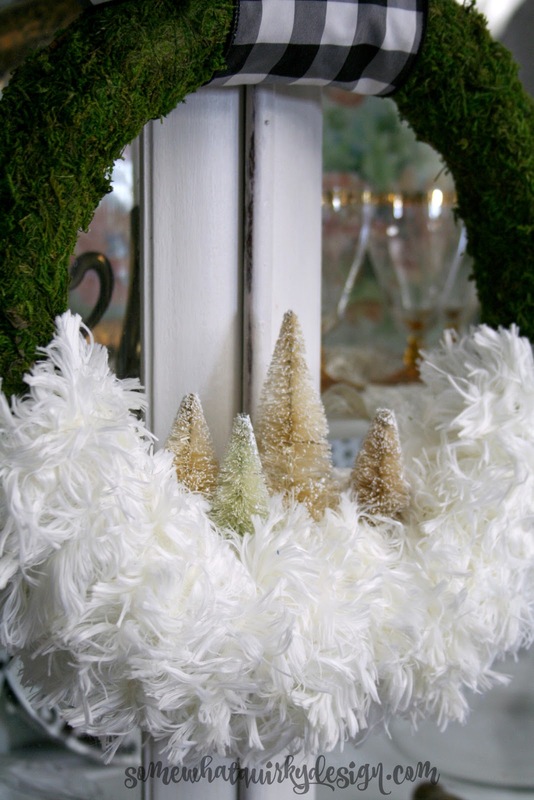 Don't you want to know how I made these really cute wreaths? If you don't you can leave now. If you do then keep reading. Get a wreath. Any kind or size will work. Or a smaller one like this. Or get one from your basement like I did. Then you need to find something to wrap snow part of the wreath with. I was cheap and used a basic white yarn (Red Heart Super Saver Jumbo in White) to cover my "snow" area. Then I wrapped the fancy yarn over that. I used Red Heart Fur yarn. I'm really glad I have some left over. I know there will be something fun to do with it. It is SO soft! Then all you have to do is stick your trees in. I bought a bunch of trees last Christmas at JoAnn at like 90% off. I found these trees on Amazon. They look nicer than the ones I used! I also found these green ones. These are a great buy. I think I will use green trees in the one I make for the front door next year because you can see them better. You can easily frost them a little bit more if you want more snow on them. You can be creative with what you use for your snow. 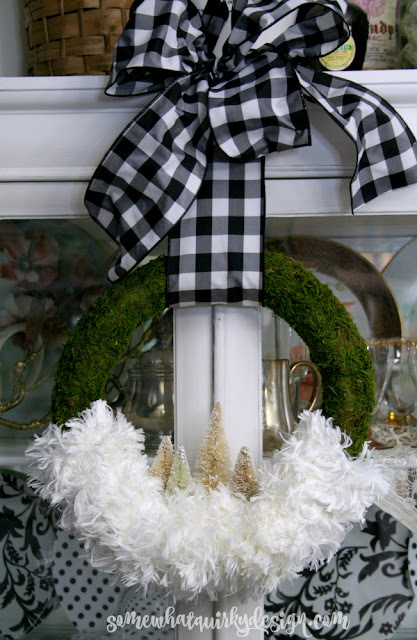 Did you notice what I used in the big door wreath? A winter scarf! It's a gorgeous scarf, but too scratchy for me to wear. I think a plaid or buffalo check fabric would look cute as well. Look how pretty that yarn is! It reminds me of Sammy's fur. So now you know what to do . . .
Tell me what new decoration you made for Christmas or winter decor this year. Those are both really cute, Karen, but it is sad that one bit the dust (er-snow) after only two days! You did a great job on them. I don't even have a winter wreath up this year because so much of my stuff is packed away in a warehouse. 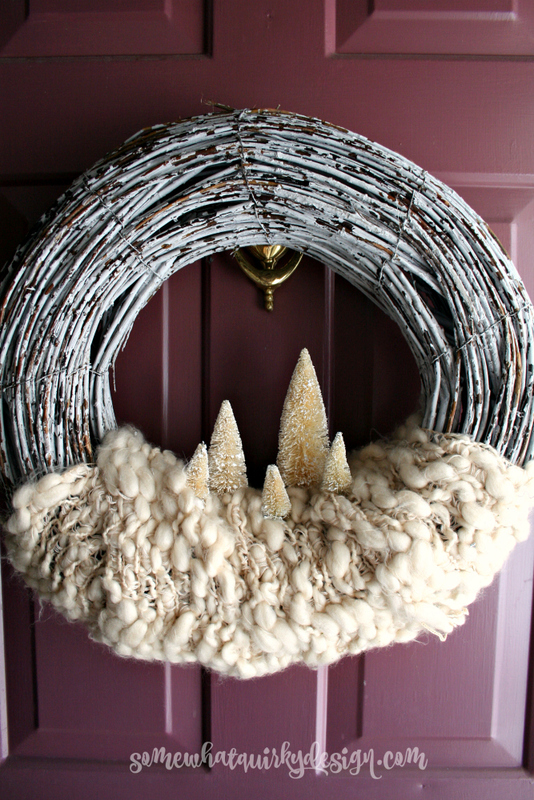 The white yarn reminds me of a labradoodle, and it’s cute on your wreath. 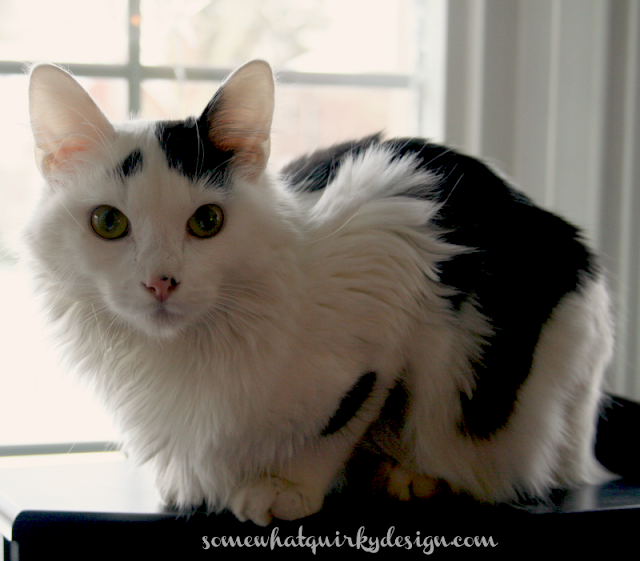 Oh, I love your wreath project, especially since it looks like your kitty's fur! 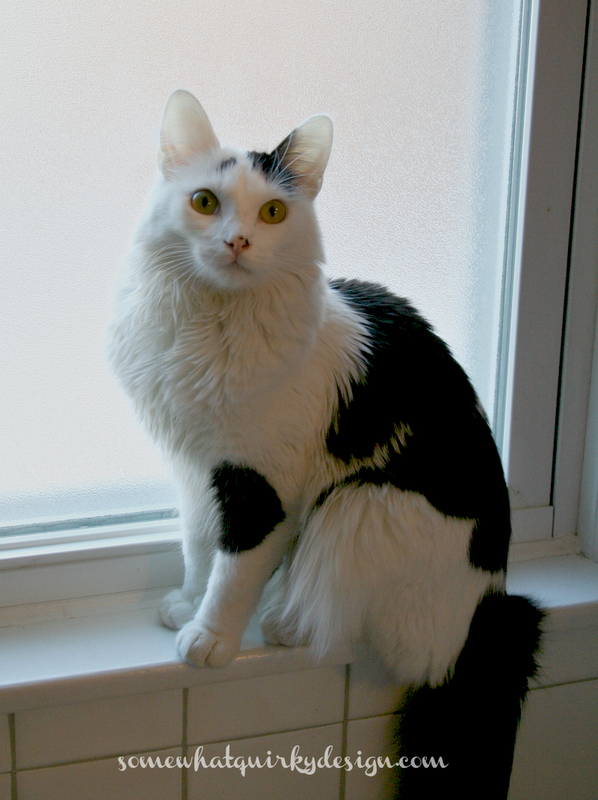 How sweet...Sammy is adorable- what a beauty!